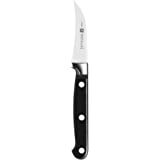 twin signature knives are precision stamped from a single piece of German steel, resulting in lighter weight knives that do not compromise sharpness. 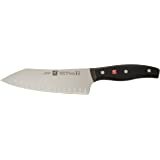 The knives are made of proprietary special formula steel that has been perfected for over 280 years. 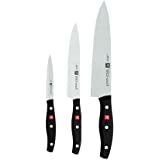 Combined with zwilling's signature ice-hardening technique, these friodur blades are harder, sharper, they will not stain or chip and they retain their sharpness longer.to ensure an ideal cutting angle, the laser-controlled edge is incredibly sharp and is honed and hand-finished by the most skilled artisans. The three-rivet handle embedded with the ZWILLING J.A. 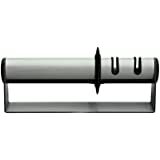 Henckels logo provides optimum durability. 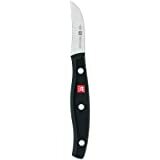 5.0 out of 5 starsThis is my second Zwilling J.A. knife, and it is great! 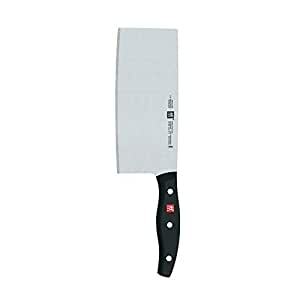 I bought a Zwilling chef knife around 3 years ago when I used to be a sushi chef. It was very nice and efficient to cut countless sushi rolls. As I started to cook at home more, I decided to buy this same brand cleaver. It did not disappoint me. 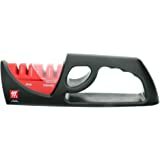 It is sharp and durable. Good to be used for various cooking skills. I am very satisfied with this knife. I had always used western style chefs knives, but have been experimenting with this vegetable cleaver style as my kitchen workhorse. 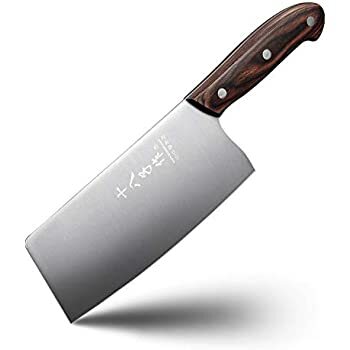 First one I got was a classic Dexter stainless steel knife (Dexter Russell 5178 Traditional Wood Handle 8" Chinese Chef's Knife). I found it to be too heavy for comfortable use (I am 5'11'' , 200lbs, with big hands). Came dull and with an irregular curve to the edge. 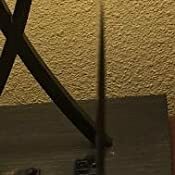 Even after I had it professionally sharpened and re-profiled it didn't keep the edge for long. Seems like relatively cheap steel. 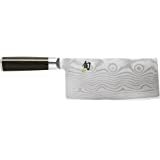 Next, I picked up an unbranded carbon steel Chinese Chef's Knife from a second hand store which had a similar handle but was lighter and better balanced. After some rust removal and professional sharpening, it was EXTREMELY sharp and kept the edge well. I knew to be mindful of not putting it away wet or using it with acidic foods, but it would start to rust AS I was using it! TOO MUCH HASSLE, as if I don't have enough things to worry about! This knife was my third purchase and was a nice middle ground. 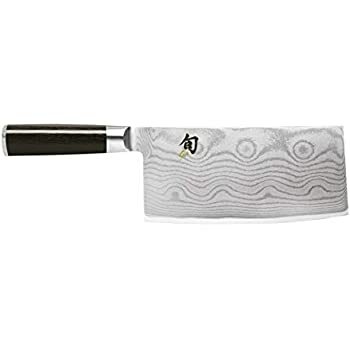 Good balance and weight, comfortable handle (while I prefer the look of the traditional round style, this looks pretty good too IMO), comes sharp and after professional sharpening is not quite as sharp as the carbon steel but still very good. No rust. 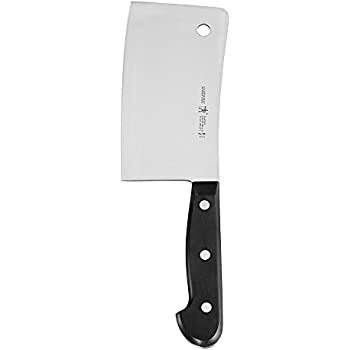 My only complaint is that the spine of the knife is not rounded, and can become uncomfortable when cutting for a long time. I used some medium grit sandpaper to dull the corners of the spine and it is very comfortable now. I purchased this as a gift for my girlfriend for christmas. She loved it, and I like it too. 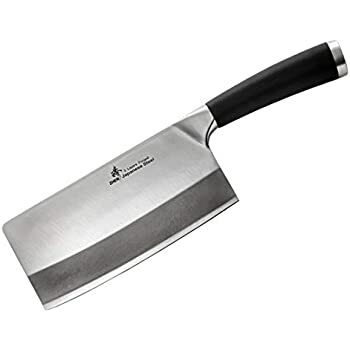 The knife is hefty, but not nearly as much so as some other cleavers. 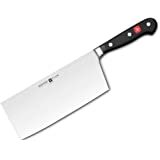 The blade is tall enough to use as a board scrapper, or for transferring chopped foods to a pan. Out of the box, it was exceptionally sharp, and has remained so, so far. We've been able to slice meat razor thin and make swift work of squash. 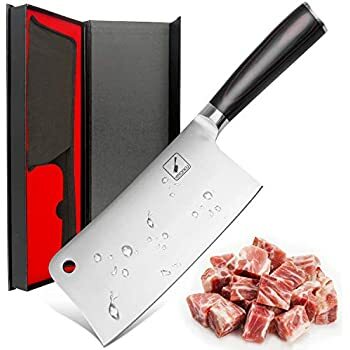 I did plenty of research and settled on this knife, and I'm not disappointed. 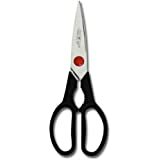 If I were purchasing a knife for myself, I would have bought a larger blade--I have large hands and prefer larger knives. She has small hands, so the 7'' suits her well. Last, we've used the knife to cut through small bones--chicken and similar, but nothing larger, and it's worked reasonably well. 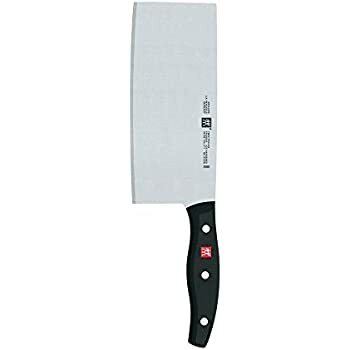 This is primarily a vegetable knife, though, watch out if you're looking for a big meat cleaver. I have28 years Chinese kitchen experience. 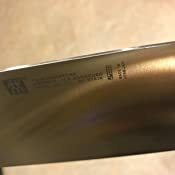 The knife Steel is sharpper but designed handle and blade too thickness, also tatol weight not qualify to perforations Chinese chef, if the company can redesign this product that I will definitely recommend . 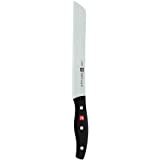 I only use henckel knives at home and usually I would just buy them at William Sonoma. This was the first time buying one online and I have to say, it works great!! It says it's for veggies, but I tried with meat "just to see". It works great for both!! 5.0 out of 5 starsGreat for Stir Frys! Outstanding for the price point! It was fairly sharp out of the box, but was improved with a hone to an extremely fine edge. There is a little more rocker to the edge than most Chinese Cleavers, which have a straight edge. 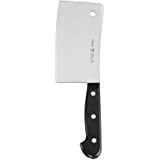 Personally, I prefer the rounded edges, because it allows the knife to be rocked on the board similar to a Chef’s Knife. Great for all veggies and boneless meats! 5.0 out of 5 starsChop Chop! Had to buy this for my 19 piece set. The block had the slot, but not the knife. I love this chopper. Heavy duty construction. 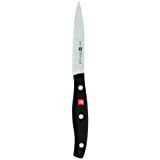 The knives go dull fairly quickly, so I recommend sharpening before each use.